Background and Objectives: Current developments in electroencephalography (EEG) foster medical and nonmedical applications outside the hospitals. For example, continuous monitoring of mental and cognitive states can contribute to avoid critical and potentially dangerous situations in daily life. An important prerequisite for successful EEG at home is a real-time classification of mental states. In this article, we compare different machine learning algorithms for the classification of eye states based on EEG recordings. Materials and Methods: We tested 23 machine learning algorithms from the Waikato Environment for Knowledge Analysis toolkit. Each classifier was analyzed on four different datasets, since two separate approaches – called sample-wise and segment-wise – in combination with raw and filtered data were applied. These datasets were recorded for 27 volunteers. The different approaches are compared in terms of accuracy, complexity, training time, and classification time. Results: Ten out of 23 classifiers fulfilled the determined requirements of high classification accuracy and short time of classification and can be denoted as applicable for real-time EEG eye state classification. Conclusions: We found that it is possible to predict eye states using EEG recordings with an accuracy from about 96% to over 99% in a real-time system. On the other hand, we found no best, universal method of classifying EEG eye states in all volunteers. Therefore, we conclude that the best algorithm should be chosen individually, using the optimal classification accuracy in combination with time of classification as the criterion. Electroencephalography (EEG) nowadays enables mobile, noninvasive measurement, and analysis of human brain activity during daily activities. The EEG measures voltage changes on the scalp resulting from ionic current within the neurons of the brain. In contrast to methods such as computed tomography or magnetic resonance imaging on imaging the brain anatomy, the EEG examination allows evaluation of the brain physiology within a temporal resolution of milliseconds. Thus, measuring and further analysis of human brain activity using EEG offers essential benefits in comparison to other modalities for functional brain imaging and enables applications beyond clinical routine. Recent research aims for real-time eye states' classification  used as a parameter for individual fatigue, drowsiness, and communication based on brain-computer interfacing., For instance, analysis of brain stimuli can help paralyzed persons to control devices using commands based on the eye blinking pattern., Yeo et al. developed a specialized system for detecting dangerous levels of sleepiness during driving based on eyes' blinking frequency. Jongkees and Colzato reported about recent research using eye blink rate as a predictor for cognitive function. Furthermore, monitoring eye blink rates can support volunteers to avoid eye diseases such as computer vision syndrome. The main goal of our current research is related to choosing efficient algorithms, applicable for performing classification of eye states from EEG recordings in a real time. 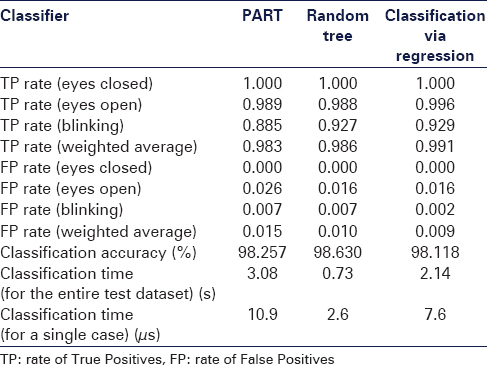 This research is an attempt of expanding results of Rösler and Suendermann  Precisely, Rösler and Suendermann tested 42 different classifiers from the Waikato Environment for Knowledge Analysis (WEKA) machine learning toolkit , and showed that it is possible to predict the eye state retrieved from EEG with an accuracy of classification higher than 97%. They chose the KStar algorithm as the best performing classifier, having the lowest classification error rate of only 2.7%. The main drawback of the KStar algorithm is the long time of classification. As a result, it cannot be used to classify large datasets in real-time systems. Sole evaluation based on accuracy consequently is unsuitable for real-time applications and online EEG processing. In addition, Rösler and Suendermann performed tests on a dataset of only one volunteer, considerably limiting the generalizability of the results. Therefore, in our research, the classifiers are evaluated in terms of three factors: classification accuracy (Acc(C)), time of classification for new, unseen cases (ToC(C)), and time of training the classifier (ToL(C)). The first two factors are prioritized for the evaluation of the classifier's efficiency, while the third factor is not critical. We tested each classifier on data acquired from 27 volunteers. Furthermore, the data were analyzed using two separate approaches – called sample-wise and segment-wise – used in combination with raw and prefiltered data. Thus, our results extend the previous publications and develop the field toward real-life applications. Data acquisition was performed in an EEG laboratory environment for research using medically approved equipment. Electrodes were placed in accordance with the 10–20 system for electrode placement  using a commercial EEG cap system (Waveguard, Advanced Neuro Technologies B. V., Enschede, Netherlands) comprising silver/silver chloride electrodes. 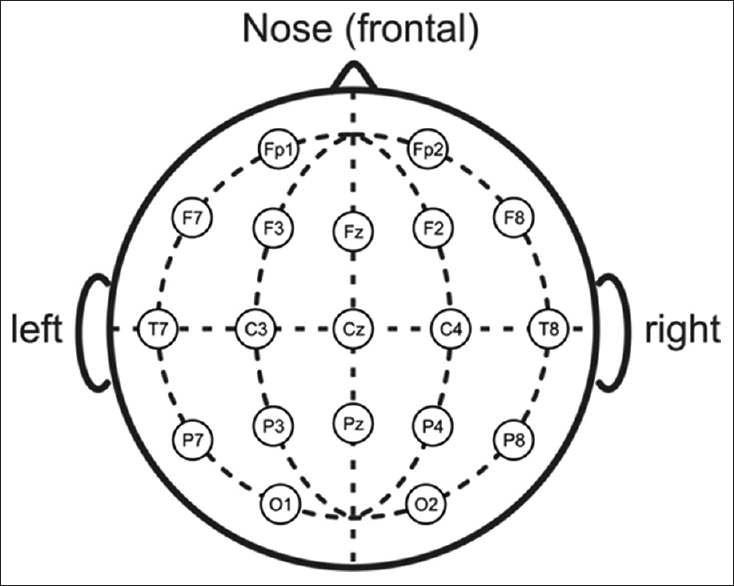 The layout of the EEG electrodes is shown in [Figure 1]. All electrode positions were manually filled with commercial electrolyte gel (ECI Electro-Gel, Electro-Gel International, USA). Electrode-skin impedances were checked to be below 25 kOhm at all electrodes. For data acquisition, we used a commercial setup (Eego Mylab, Advanced Neuro Technologies B. V., Enschede, Netherlands) at a sampling rate of 1024 samples/s. The reference electrode was placed at the right mastoid, while the GND electrode was placed at the left mastoid position. Before the recordings, the volunteers were informed about the equipment, measurement processes, and tests procedures. Every volunteer gave written informed consent. Ethics committee approval was obtained before the study. All 27 volunteers were healthy with no known record of neurological, psychological, ophthalmological, or dermatological diseases. The average age of the volunteers was 27.6 ± 8.2 years. Three different sequences of EEG were analyzed: eyes open, eyes closed, and externally triggered eye blinks. During the eyes' open session, the volunteers were asked not to blink their eyes for about 1 min during a recording of 2 min. During eyes closed session, the volunteers had to keep their eyes closed for about 2 min. Within the eye blink session, the volunteers had to blink their eyes naturally after a beep tone while avoiding additional eye blinks. The interval of beep tones was 3 s.
The input data for training and subsequent testing of classifiers were saved in the form of a two-dimensional decision table(s) (or dataset(s)) in which cases, i.e., single samples-in-time or segments consisting of ten subsequent samples [Figure 2] – were described by conditional attributes and a decision. Attributes are independent variables, whereas the decision is one dependent variable. A simplified example of a decision table is given in [Table 1], with the attributes' electrodeposition (C3, Cz, and C4) and with a decision Eye_state. The set of all cases labeled by the same decision value is called concept. For instance, for [Table 1], case set (1, 2, 4) is a concept of all cases such that the value of Eye_state was closed eyes. The two remaining concepts are sets (3, 5, 8) (for these cases, Eye_state has the value open eyes) and (6, 7) (with Eye_state value equals blinking). The eye states were manually annotated by visual inspection and selection of the corresponding EEG recordings. For eyes open and eyes closed, sequences of 10 s were selected from the overall 2 min recordings, where no eye blink or other artifact was visible in any of the 19 electrode signals. For eye blinks, 10 representative, individual eye blink segments were selected, using 1 s of data following a beep tone trigger. No multiple eye blinks were allowed. The eye blink state was identified to start at the initial deviation from the EEG baseline and end at the return to baseline. [Figure 3] shows an example of an eye blink signal at electrode Fp1. All data before and after the eye blink were identified as eyes' open state. In our experiments, four differently processed datasets – recorded for 27 volunteers – were used including (i) raw sample-wise, (ii) filtered sample-wise, (iii) raw segment-wise, and (iv) filtered segment-wise datasets [Figure 1]. We assured that all prepared and tested datasets were complete, without any missing attribute values. Furthermore, all cases were preclassified by an expert, i.e., every sample-in-time or segment must be assigned to one out of the three classes. The raw sample-wise dataset contains separate individual samples-in-time acquired in parallel at 19 electrode positions. 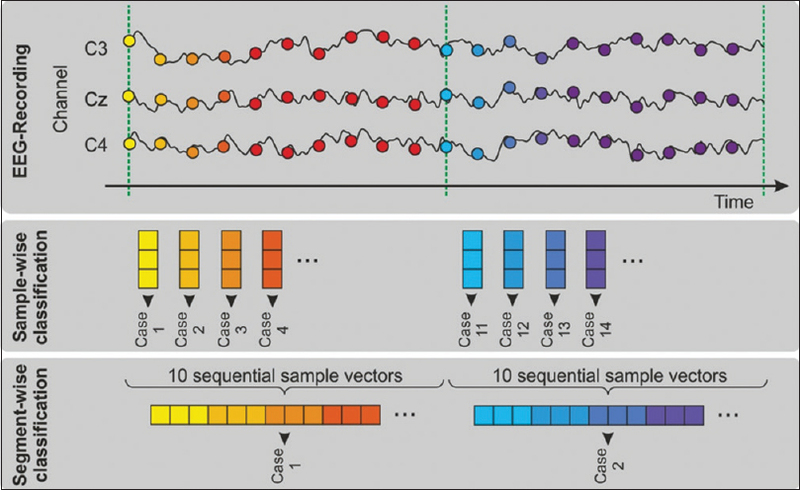 Thus, each of the cases (i.e., sample-in-time) is described by 20 attributes [Figure 2], comprising 19 descriptive attributes representing EEG data values acquired from the analyzed electrodes, and one decision attribute for the eye state (closed, open, or blinking). The raw sample-wise dataset (called as SamRD) contains 829,494 cases of samples-in-time, including 276,507 cases for closed eyes, 474,641 cases for open eyes, and 78,346 cases for eye blinking [Figure 4]a. The second dataset – filtered sample-wise (also called SamFD) – contains prefiltered data. Prefiltered data comprise the same samples used for the raw data. However, before extraction of the selected data sequences, the whole recording was filtered using a Butterworth bandpass with cutoff frequencies at 1 and 40 Hz as well as a Butterworth band stop with cutoff frequencies at 49 and 51 Hz. The filtered version of data (SamFD) contains an identical number of cases for each concept as the original (raw) dataset. 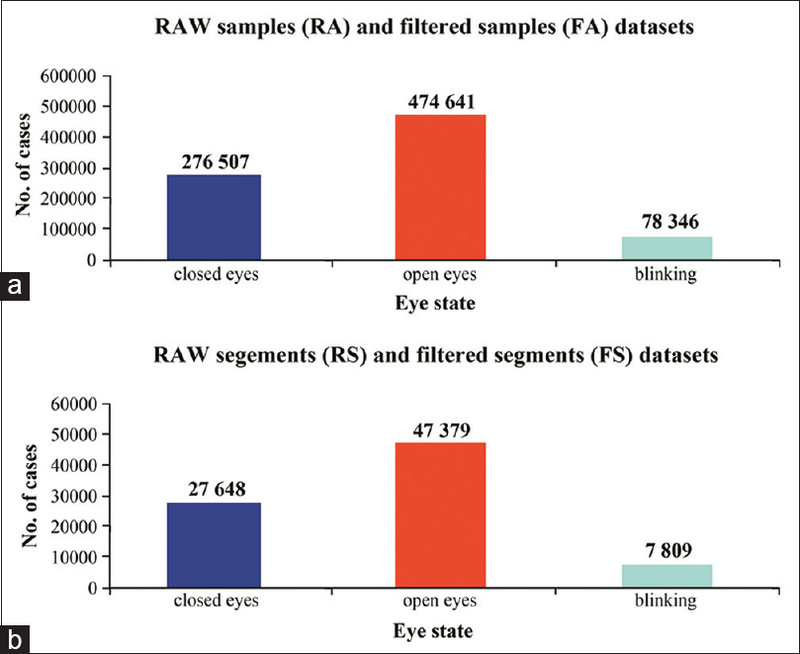 In the case of both segment-wise datasets – raw and filtered, called as SegRD and SegFD, respectively – each dataset contains 82,836 segments, including 27,648 cases for closed eyes, 47,379 cases for open eyes, and 7809 cases for eye blinking [Figure 4]b. To enable other researchers to further explore or reproduce the results presented in this article, we released a public repository. After registering on the web page of Institute of Biomedical Engineering and Informatics of TU Ilmenau, 98684 Ilmenau, Germany and subsequent approval, the datasets can be downloaded from. The main tool used in our research for classification was the WEKA machine learning toolkit developed at the Waikato University, New Zealand., Thus, all analyzed datasets were prepared using the required Attribute-Relation File Format (ARFF) format. The ARFF files have two distinct sections, including header and data information. The format of the first line in the header section is @relation <relation-name>, where <relation-name> is a string with the name (description) of the dataset. The next lines contain attribute declarations in the form of an ordered sequence of @attribute statements, using the notation @attribute <attribute-name><datatype>. Each attribute from the dataset must have its own @attribute statement, which uniquely defines its name and data type. The WEKA toolkit supports four types of attributes, including numeric, nominal, string and data format. In case of our EEG data, all conditional attributes are numeric, i.e., containing real or integer numbers, and decision is a nominal type attribute with three allowed values: Closed_eyes, open_eyes, and blinking. The data section in the second part of the file contains the data declaration line and the actual instances (i.e., cases) lines. The @data declaration is a single line indicating the beginning of a data segment. Each instance is represented on a single line, where attribute values are delimited by commas and carriage returns denoting the end of each instance. The structure of an example dataset, containing raw samples-in-time saved in the ARFF file is presented in [Figure 5]. 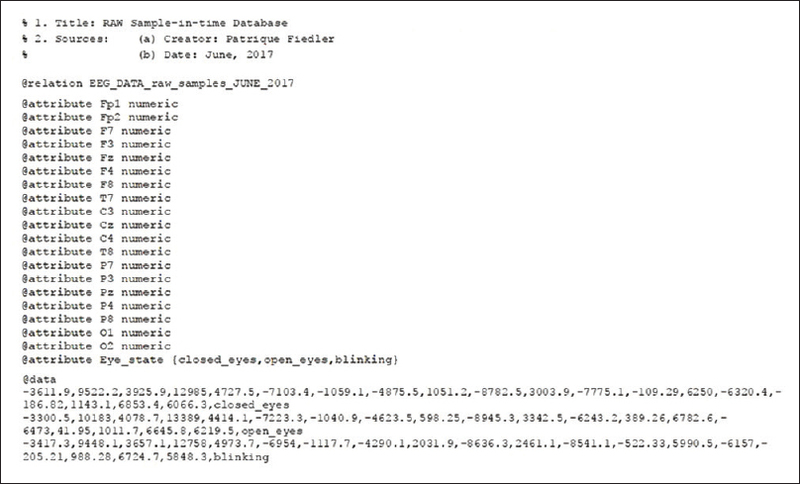 Experiments for all classifiers were performed on a compute server (128GB, 4CPU's 6CORE Xeon E7450, 2.4GHz). The remaining 34% of all cases (i.e., 282,028 for both sample-wise datasets and 28,164 for both segment-wise datasets) for testing the classifiers. ToL(C) – time of its learning phase. In this research, 23 machine learning algorithms were tested including (i) three Bayes type classifiers, (ii) three functions, (iii) one “lazy” classifier, (iv) five decision rule-based algorithms, (v) six decision tree-based algorithms (including aggregated Random Forest classifier), and (vi) four meta-type classifiers [Figure 6] and [Figure 7]. Based on the performed tests, 10 of all 23 machine learning algorithms turned out to be effective in the analyzed domain of EEG eye state classification. The Accuracy of a classifier C (i.e., Acc(C)) is the percentage of testing dataset cases classified correctly. The error rate or misclassification rate of a classifier C is equal to 1–Acc(C). To accept a classifier as effective or at least acceptable, we set a threshold for its classification accuracy of at least 90%. Second, besides the acceptable average value of the classification accuracy, the analyzed classifier must correctly differentiate cases from different concepts (i.e., eye states) at the same time. Randomizable Filter Classifier – A simple version of the filtered classifier that implements the randomizable interface, useful for building ensemble classifiers using the RandomCommittee meta-learner (tested for baseline classifier IBk with k = 1). Afterward, the analysis of the confusion matrix of OneR [Table 2] shows that, despite the high average value of classification accuracy, this classifier will be useless, due to the poor quality of differentiation of cases belonging to other concepts. For instance, about 19% blinking (i.e., 5078 out of 26746) cases were classified as open eyes. Therefore, in the first phase, 12 out of 23 classifiers were chosen as potential candidates for real-time classification of EEG eye states [Table 3] and [Table 4], since each of them (i) achieved Acc(C) >90% and (ii) simultaneously correctly differentiates cases from different concepts. The time of classification should be short, at least in reference to other classifiers belonging to the same subgroup as the analyzed one. Furthermore, in case of an EEG data sampling frequency of 1024 samples/s, the time of classification should not exceed 0.98 ms. A longer classification time would inhibit real-time classification. Thus, two of 12 initially preselected classifiers do not fulfill this additional condition. At first, the IBk classifier – i.e., the implementation of kNN algorithm in WEKA toolkit – must be rejected from the list. The kNN algorithm is a type of instance-based learner (or lazy learner), where the function is approximated only locally and all computation is postponed until classification. Due to the necessity of computing the distances from the test case to all other cases of the analyzed dataset, the kNN algorithm is computationally expensive, especially for large training datasets. The results from [Table 3] and [Table 4] show that, in our case, the time of classification in comparison to the other classifiers is the longest. For instance, in reference to an example segment-wise dataset (e.g., SegRD dataset), IBk classifies only about 79 cases/s, whereas most classifiers allow to classify over a 100,000 cases during 1 s [Table 4]. A similar situation can be observed for the random filter classifier aggregated algorithm, when IBk was used as a baseline classifier. The speed of classification increased almost twice in the sample-wise SamRD dataset (from 5.4 to 10.4 cases/s) and threefold for segment-wise SegRD dataset (from 79.2 to 252.7 cases/s) but still not enough to be considered as acceptable. Based on the results reported in [Table 3] and [Table 4], it can be clearly seen that all 10 remaining (i.e., finally selected) classifiers allow to perform the real-time classification, assuming that the sampling rate is 1024 samples/s (or less). Precisely, the classification time of a single case – individual samples-in-time or segments – ranges from only 2.6 μs to a maximum of 104.9 μs and consequently is much shorter than the interval between the consecutive measurements (i.e., <0.98 ms). In other words, the classification of a single case will be performed much earlier by the best ten classifiers than new, subsequent measurement from the data acquisition would appear. The last important factor is the time required to build the machine learning model (i.e., training time). For instance, if both comparable classifiers have similar values of Acc(C) and ToC(C), the classifier with a shorter training time will be selected as more efficient. For instance, the classification accuracy of JRip and PART does not differ more than 0.4% for sample-wise and 0.071% for segment-wise approaches. Second, the time of classification of both algorithms is almost identical with values of a few microseconds. On the other hand, the PART highly outperformed JRip in reference to the time of training the classifier [Table 5] and consequently, the PART algorithm was chosen to be superior to JRip. 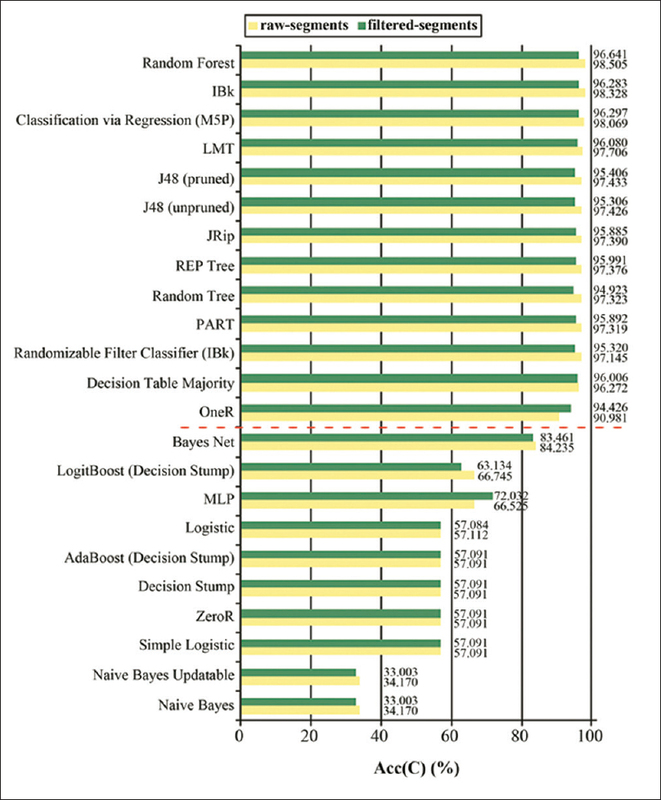 Based on the achieved results, it is clearly visible that most of the 10 selected best classifiers outperformed the KStar classifier proposed in Rösler and Suendermann. The KStar belongs to the group of instance-based learning algorithms, so-called lazy learners. Lazy-type classifiers – like, for example, kNN or locally weighted learning  – perform a classification by comparing the analyzed case to the entire dataset of preclassified cases. Thus, the biggest disadvantage of using KStar relates to the fact that it is definitely too slow for the envisaged real-time classification. Furthermore, Rösler and Suendermann achieved classification accuracy of the KStar algorithm of 97.3% for the binary classification problem, since their analysis was performed only for closed and open eyes, whereas in our research, three different concepts (closed, open, and blinking eyes) were investigated. In addition, Rösler and Suendermann used a much smaller dataset with only 14,977 cases, containing information about only one volunteer. In contrast, we analyzed information of 27 different volunteers. Thus, our results advance the field in terms of reliability and generalizability. The comparison of the results of the ten selected (i.e., the best) classifiers for sample-wise and segment-wise approaches shows that classification accuracy is on a similar level. Differences between results of both approaches do not exceed 1.5% for any classifier. The slightest difference of only 0.77% was noted for random forest, and the highest of 1.43% for the unpruned and 1.45% for the pruned version of decision tree generated using the J48 (C4.5) algorithm. These differences result from the fact that, in the segment-wise approach, each segment – containing ten consecutive samples – is more complex to analyze by any machine learning algorithm compared to an individual sample-in-time, i.e., case in the sample-wise approach. On the other hand, the segment-wise dataset stores time dependencies among 10 grouped subsequent samples-in-time. As a result, the possibility of detecting and recognizing the patterns' meaning in different eye states (e.g., eye blinking) is higher. Despite these differences, both proposed approaches proved to be effective, since the classification accuracy ranges from above 96% for simple DTMaj algorithm up to over 99% for the Random Forest classifier [details in [Table 3] and [Table 4]. Analysis of the results showed that, in general, classification accuracy is higher for classifiers generated for the raw data rather than for the filtered, especially for the segment-wise data [Figure 7]. However, this principle is not universal and could not be arbitrarily applied to each dataset. In most cases, the shorter time of classification (or higher speed of classification) of a single, new case for a sample-wise approach than for a segment-wise approach (see [Table 3] and [Table 4]). Efficient time of classification of a new case for both approaches, since a value of ToC(C) for a single case – i.e., individual sample-in-time and/or an entire segment of data – is equal only from a few to several tens of microseconds (not more than 104.9 μs for the Random Forest classifier). Furthermore, the time of classification of a single case is very close for each selected classifier in both approaches. Shorter time of training/building the classifier model [Table 5] and shorter time of its validation – i.e., total time of testing performed on the entire testing dataset – for a segment-wise approach. One meta-type classifier, using as a baseline model the MP5 decision tree. Thus, it can easily be interpreted and further investigated by a person being an expert in the EEG domain. In case of the three decision rule-based classifiers, the highest classification accuracy and the shortest time of classification are observed for the JRip algorithm. However, the PART algorithm was chosen to be superior to JRip. The classification accuracy of JRip and PART does not differ more than 0.4% for sample-wise and 0.071% for segment-wise approaches. Time of classification for both algorithms is almost identical with values of a few microseconds. 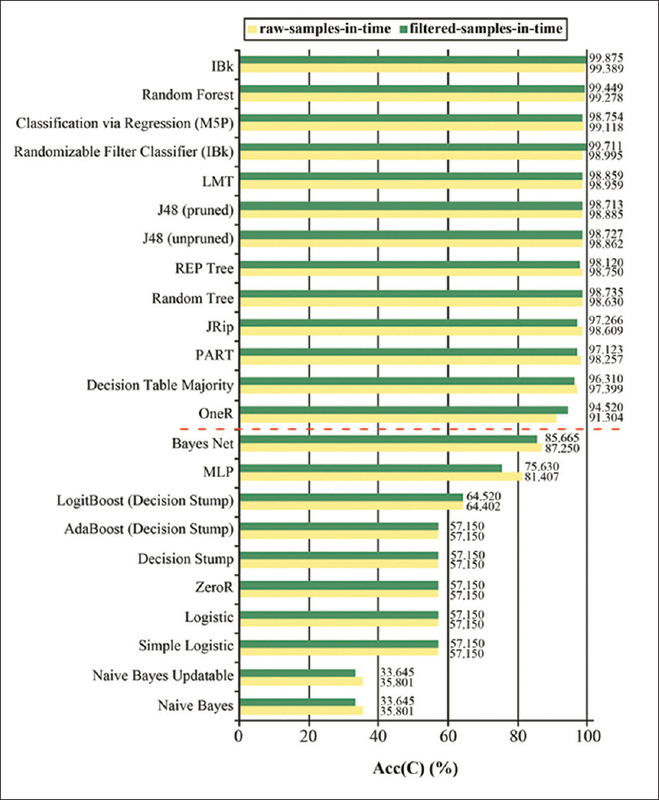 However, PART outperformed JRip in reference to the time of training the classifier model, since it was almost 18 times faster for samples-in-time and 3-times faster for segments [Table 5]. The aforementioned criterion was also applied to the six decision tree-based classifiers, where the optimal one seems to be the random tree algorithm, mainly because of the shortest time of training and very similar results of two remaining factors to the other decision trees. In the case of meta-type classifiers, the classification through regression (with MP5) is the only one from that subgroup fulfilling the criterion of high classification accuracy and acceptable values of ToC(C) and ToL(C). A list of the three most efficient or optimal classifiers of each subgroup is presented in [Table 6]. Based on the aforementioned facts, we furthermore found that there is no best, universal method of classifying EEG eye states. 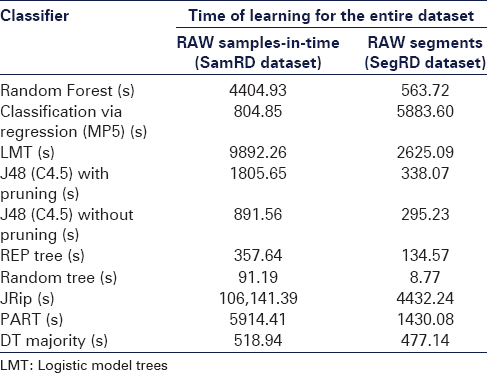 For instance, the highest value of classification accuracy was obtained for Random Forest classifier; the fastest classification could be performed using random tree and/or REP Tree classifiers, whereas the shortest time of training/building was noted for random tree. Further, it can be observed that classifiers built for sample-type datasets are more complex than those for segment-type datasets [Table 7], since they contain more decision rules or larger decision trees. Analysis of the classification results showed that, in general, the classification accuracy to be slightly higher for classifiers generated for the raw data rather than for the filtered. However, this principle is not universal and could not be arbitrarily applied to each result. Thus, on the basis of our current research reviewing different machine learning methods used for EEG eye state classification, we may conclude that, for every specific dataset, the best algorithm should be chosen individually, using as the criterion of optimality the value of classification accuracy in conjunction with times of classification. Bottom-up and top-down – For bottom-up approaches, small intervals are recursively merged into larger intervals, whereas in top-down approaches, intervals are recursively split into smaller ones. Therefore, not all machine learning algorithms can be directly applied for classification of EEG data. For instance, the Iterative Dichotomizer 3 (ID3) developed by Ross Quinlan  is the well-known algorithm used very often to generate decision trees from the different types of datasets using Shannon entropy. However, ID3 requires preprocessing of the dataset with numerical values, by initial conversion of all numerical attributes into discrete values. An extension of Quinlan's ID3 algorithm is the C4.5, which enables (i) handling both – i.e., numerical and symbolic – attributes, (ii) handling data with missing attribute values, and (iii) pruning trees. The decision tree created using the J48 (C4.5) algorithm for the data from [Table 1] is presented in [Figure 8]. Two other machine learning models, including Modified Learning from Examples Module, version 2 (MLEM2) and random tree  are presented in [Figure 9] and [Figure 10], respectively. Each of those classifiers correctly covers all cases from the training dataset. The only difference is the structure of these models. In both cases, including decision rules induced by MLEM2 and decision tree generated by random tree, two attributes (C3 and Cz) are used in the process of classification. For the decision tree generated by J48 (C4.5), cases are differentiated based on using three intervals determined by two cut point values equal – 21,000 and 3900 of only one attribute C3. Therefore, to improve the current results in future research, we propose using (i) selected methods of discretization and (ii) feature extraction algorithms as a preprocessing phase. In reference to discretization, Grzymała-Busse recently proved in  that the new multiple scanning method is significantly better than other methods. Namely, multiple scanning outperforms internal discretization used in the C4.5 algorithm or two other globalized discretization methods: equal interval width and equal frequency per interval. Multiple scanning allows to achieve higher values of classification accuracy and significantly simpler decision trees than other methods of discretization. Second, feature extraction algorithms should allow to filter the data by selection of only the most important (i.e., dominant) attributes strongly correlated with the decision, and rejection of so-called redundant attributes at the same time. Thus, it seems that using algorithms from these two domains should allow to further improve our current results of classifying EEG eye states, mainly in terms of low error rate and complexity of newly generated machine learning models. Ten out of 23 tested classifiers fulfilled the determined requirements of high classification accuracy and short time of classification and can be selected as applicable for the process of real-time EEG eye state classification. Therefore, in this article, we showed that it is possible to predict eye states using EEG recordings with an accuracy from about 96% to over 99% in a real-time system. Furthermore, all selected classifiers belong to supervised machine learning algorithms including decision rules and decision trees. Thus, all output models – for example, a set of decision rules induced by PART algorithm or other(s) – can easily be interpreted and further investigated by a person being an expert in the EEG domain. Niedermeyer E, da Silva FL. Electroencephalography: Basic Principles, Clinical Applications, and Related Fields. 5th ed. Philadelphia, USA: Lippincott, Williams and Wilkins, A. Wolter Kluwer Company; 2005. Rösler O, Suendermann D. A first step towards eye state prediction using EEG. Proc. of the International Conference on Applied Informatics for Health and Life Science (AIHLS'2013). Istanbul, Turkey; 2013. 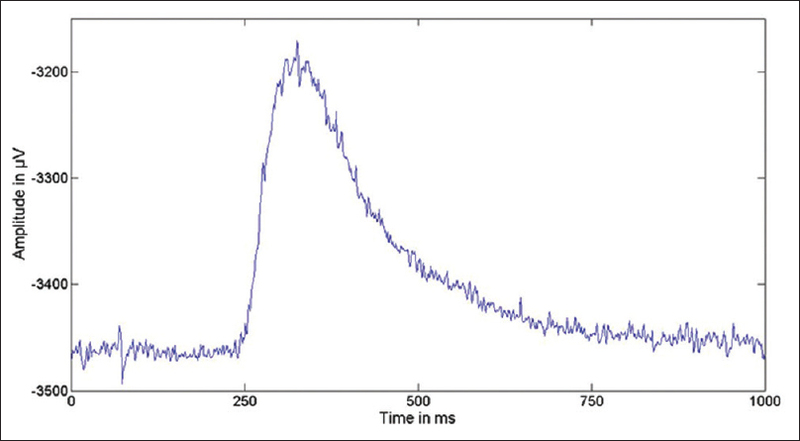 Stern JA, Boyer D, Schroeder D. Blink rate: A possible measure of fatigue. Hum Factors 1994;36:285-97. Yeo MV, Li X, Shen K, Wilder-Smith EP. Can SVM be used for automatic EEG detection of drowsiness during car driving? Saf Sci 2009;47:115-24. Fuangkaew S, Patanukhom K. Eye state detection and eye sequence classification for paralyzed patient interaction. Proc of the 2nd IAPR Asian Conference on Pattern Recognition (ACPR'2013). Okinawa, Japan; 2013. Chambayil B, Rajesh S, Rameshwar J. Virtual keyboard BCI using eye blinks in EEG. Proc. of the 6th IEEE International Conference on Wireless and Mobile Computing, Networking and Communications (WiMob'2010). Niagara Falls, NU, Canada; 2010. Jongkees BJ, Colzato LS. Spontaneous eye blink rate as predictor of dopamine-related cognitive function – A review. Neurosci Biobehav Rev 2016;71:58-82. Portello JK, Rosenfield M, Chu CA. Blink rate, incomplete blinks and computer vision syndrome. Optom Vis Sci 2013;90:482-7. Available from: https://www.cs.waikato.ac.nz/ml/index.html. [Last accessed on 2017 Oct 31]. Sharma TC, Jain M. Weka approach for comparative study for classification algorithms. Int J Adv Res Comput Commun Eng 2013;2:2013. Cleary J, Trigg LK. An instancje-based learner using an entropic distance measure. Proc. of the 12th International Conference on Machine Learning (ICML'1995). Lake Tahoe, USA; 1995. Klem GH, Lüders HO, Jasper HH, Elger C. The ten-twenty electrode system of the international federation. The international federation of clinical neurophysiology. Electroencephalogr Clin Neurophysiol Suppl 1999;52:3-6. Grzymała-Busse JW. Rule induction. In: Maimon O, Rokach L, editors. Data Mining and Knowledge Discovery Handbook. Ch. 13. Springer, Boston, MA, USA; 2005. p. 218-25. The EEG Repository of BMTI. Available from: https://www.tu-ilmenau.de/en/institute-of-biomedical-engineering-and-informatics/research/. [Last accessed on 2017 Oct 31]. Kohavi R, Sommerfield D. Targeting business users with decision table classifiers. Proc. of the 4th International Conference on Knowledge Discovery and Data Mining (KDD'1998). New York, USA; 1998. Holt RC. Very simple classification rules perform well on most commonly used datasets. Mach Learn 2003;11:63-9. Cohen WW. Fast effective rule induction. Proc. of the 12th International Conference on Machine Learning (ML'1995). Tahoe City, California, USA; 1995. p. 115-23. Available from: https://www.cs.waikato.ac.nz/ml/weka/book.html. [Last accessed on 2017 Oct 31]. Frank E, Hall M, Pfahringer B. Locally weighted naive bayes. Proc. of the 19th Conference in Uncertainty in Artificial Intelligence (UAI'2003). Acapulco, Mexico; 2003. p. 249-56. Grzymała-Busse JW. C3.4 discretization of numerical attributes. In: Klösgen W, Żytkow J, editors. Handbook on Data Mining and Knowledge Discovery. Oxford: Oxford University Press; 2004. p. 218-25. Dougherty J, Kohavi R, Sahami M. Supervised and unsupervised discretization of continuous features. Proc. of the 12th International Conference on Machine Learning. Tahoe City, CA, USA; 1995. p. 194-202. Pfahringer B. Compression-based discretization of continuous attributes. Proc. of the 12th International Conference on Machine Learning. Tahoe City, CA, USA; 1995. p. 456-63. Chmielewski MR, Grzymała-Busse JW. Global discretization of continuous attributes as preprocessing for machine learning. Int J Approx Reason 1996;15:319-31. Kohavi R, Sahami M. Error-based and en tropy-based discretization of continuous features. Proc. of the 2nd International Conference on Knowledge Discovery and Data Mining. Portland, OR, USA; 1996. p. 114-9. Grzymała-Busse JW. MLEM2 – Discretization during rule induction. Proc. of the International Conference on Intelligent Information Processing and WEB Mining Systems (IIPWM'2003). Zakopane, Poland: Springer-Verlag; 2003. p. 499-508. Quinlan JR. C4.5, Programs for Empirical Learning. San Francisco, CA, USA: Morgan Kaufmann Publisherr, Inc.; 1993. Quinlan JR. Bagging, boosting, and C4.5. Proc of the 13th National Conference on Artificial Intelligence. Cambridge, MA, USA: AAAI Press/MIT Press; 1996. p. 725-30. Grzymała-Busse JW. Discretization based on entropy and multiple scanning. Entropy 2013;15:1486-502.